The top 10 exporting enterprises in Canada accounted for nearly 25% of total export sales in 2014. There were over 41,000 identified goods-exporting enterprises operating in Canada in 2014, accounting for 95% of exports. Export revenues were concentrated among a small number of firms, with roughly 500 large enterprises and 8,100 small- and medium-sized enterprises (SMEs) accounting for 98.5% of export sales. The top 10 exporting enterprises accounted for almost a quarter of total exports, while the top 50 generated more than half. The top 100 exporting enterprises, in turn, were responsible for nearly 65% of total sales. Approximately 70 exporting enterprises in Canada had exports of more than $1 billion, and 450 exporting enterprises had exports of over $100 million. The top 1,000 enterprises accounted for 88% of exports, each reporting export revenues of over $35 million in 2014. The top 10 exporting enterprises were large firms, consisting of 500 or more employees. These 10 exporting enterprises had complex business structures, referred to as enterprise groups, and represented nearly 220 different declaring units. Large enterprises accounted for $349 billion worth of exports compared with $120 billion for SMEs. The 488 large enterprises with export sales over $25 million accounted for all but $2 billion in sales by large enterprises. The 8,139 SMEs with export sales over $1 million, together, generated all but $4 billion. An additional 771 large firms and 31,811 SMEs accounted for the remaining value. Enterprises in the manufacturing industries generated nearly half of export sales, and together with mining, oil and gas (12%), wholesale (14%) and business services (17%) industries accounted for 92% of exports. Sales of finance and insurance, utilities and construction, transportation and warehousing, and other services industries rounded out exports. Large firms accounted for 75% of Canada's total exports in 2014, and had a similar share in the manufacturing sector. Exports by enterprises in transportation equipment manufacturing as well as primary metal manufacturing were almost entirely attributable to large firms. Of the $85 billion in exports for the transportation equipment industry, $80 billion was generated by large companies. Total exports by the primary metal industry reached $30 billion, with large enterprises accounting for $27 billion. Outside of manufacturing, export sales by mining, oil and gas industries were highly concentrated in large firms, which accounted for over 90% of sales. SMEs generated 26% of Canada's exports in 2014 and represented a similar share in the manufacturing sector as a whole. When examining individual industries within the manufacturing sector, however, SMEs were better represented. Roughly 40% of foreign sales ($10 billion of $24 billion) in the chemical manufacturing industry and 64% of sales ($8 billion of $12 billion) in the machinery manufacturing industry were generated by SMEs. As well, 36% of foreign sales ($8 billion of $21 billion) in the food manufacturing industry and 75% of sales ($5 billion of $7 billion) in the fabricated metal industry were attributable to SMEs. Exports by the wholesale industry were split almost evenly between SMEs and large firms. Export sales in 2014 were highly concentrated in exporting enterprises that sold goods to both the United States and to other countries. Of the $468.1 billion of exports, 81% were exported by enterprises that served multiple markets. Notably, in excess of 800 enterprises (195 large firms and 618 SMEs) that exported to more than 20 different partner countries accounted for 40% of foreign sales. Exports to the United States were $356 billion, with 75% attributable to large firms, while SMEs were responsible for the balance. Exports to the rest of the world were $112 billion, with 74% attributable to large firms and 26% to SMEs. Of the top 10 exporting enterprises, $97 billion of foreign sales were destined for the United States and $20 billion for other countries. The top 100 firms generated exports of $232 billion to the United States and $70 billion to other destinations. The top 1,000 firms accounted for $315 billion of sales to the United States and $99 billion of sales to the rest of the world. From a regional perspective, SMEs accounted for 25% of the sales to North America, 32% of the sales to Asia (Canada's largest export region after North America), 17% of the sales to Europe, 39% of the sales to Central and South America and the Caribbean, 30% of the sales to the Middle East, 37% of the sales to Africa and 45% of the sales to Oceania. The Trade by Enterprise Characteristics (TEC) Program is an initiative at Statistics Canada undertaken to analyze the business characteristics of exporters in Canada. These estimates are formed by linking customs trade data records with those of Statistics Canada's Business Register. Export data to US destinations are collected by the US Bureau of the Census and transmitted to Statistics Canada under the Canada–US data exchange, while export data to the rest of the world are collected jointly by Statistics Canada and the Canada Border Services Agency. The Business Register contains the complete operating and legal structure of enterprises operating in Canada, as well as their key characteristics such as employment size and North American Industry Classification System classification code. Aggregate TEC data were first released in The Daily on April 1, 2015. Enterprise groups are complex firms composed of many exporting enterprises. For the purposes of this analysis, an enterprise group is counted once and the value of its exports corresponds to the aggregated export value of its exporting enterprises. 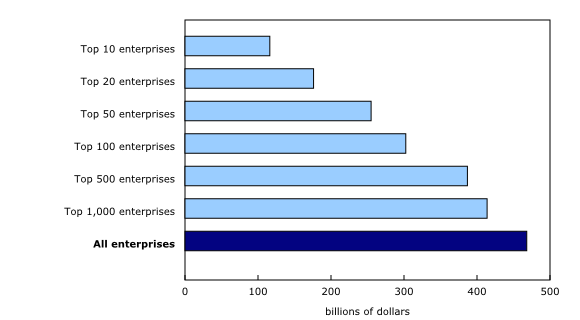 An enterprise group's industry classification is based on the primary export activity of the enterprise with the highest value of exports within the enterprise group. The concept of "enterprise groups" facilitates the identification of enterprises engaged in trade with affiliates, enterprises that both export and import, and enterprises that export both goods and services. These extensions to the TEC Program will allow users to examine more closely Canada's role in global value chains. Small and medium-sized enterprises have fewer than 500 employees. The TEC Program linked about 95% (or $468.1 billion) of the value of domestic exports to enterprises or enterprise groups within the Business Register. The remaining 5% were attributable to non-resident exporters not included in the Business Register or enterprises with insufficient exporter information. Throughout this release, when discussing the percent share of export sales, it is the share of the $468.1 billion for which there was an identified exporting enterprise. Standard data tables from the Trade by Enterprise Characteristics Program for exporters of goods in Canada in 2014 by employment size class are now available upon request. These new data tables provide information on the number of exporting entities and the value of exports, and are available by employment size class, by industry and by trading partner. Customized Canada data tables for 2014 are available upon request on a cost-recovery basis. For more information, to order data, or to enquire about the concepts, methods or data quality of this release, contact Diana Wyman (trade@statcan.gc.ca), International Accounts and Trade Division.